Months of Inventory (MOI)* continues to float near 5 months. 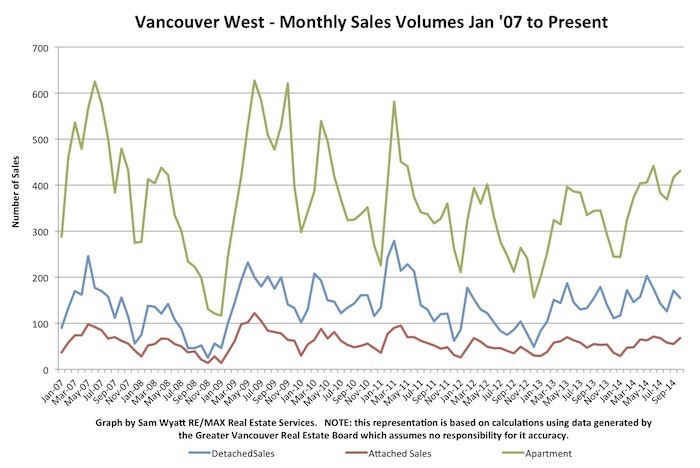 The MOI dropped to under 4 months for all but detached houses in October for Vancouver West Real Estate. 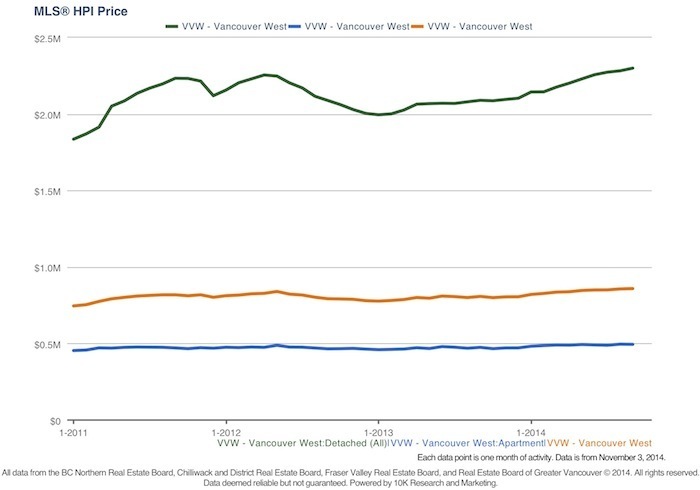 In terms of sales volumes, the fall real estate market in Vancouver has been the best we've seen since 2009. If a listing has not sold within about a month, chances are, there is an issue with the price or the presentation. Active listing volumes have stayed persistently high relative to pre-credit-crises numbers but the continuing strong sales volumes have overcome the downward pressure this might have otherwise had on pricing. 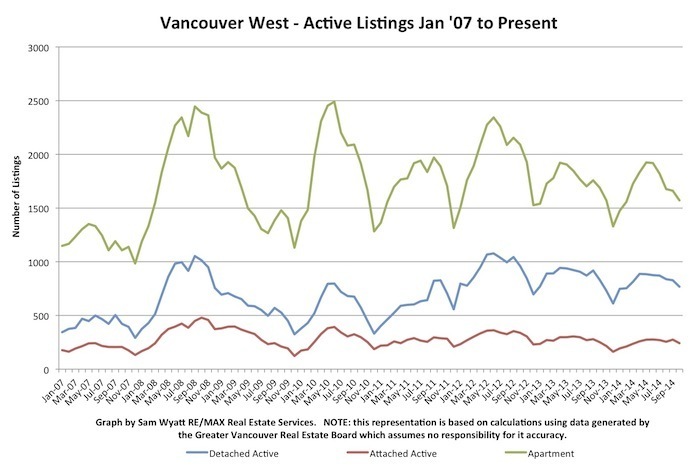 We will see active listings volumes continue to fall as we approach December. The US Federal Reserve Bank (Fed) introduced "quantitative easing 3" (QE3) back in the spring of last year to buy back $85 billion dollars a month of bonds and mortgage backed securities by effectively "printing" money (member banks' deposit accounts were simply increased). As a result, fixed rate mortgages fell to all time lows. The Fed has just ended the QE3 program but thus far the bond market and mortgage rates do not seem to have been impacted. 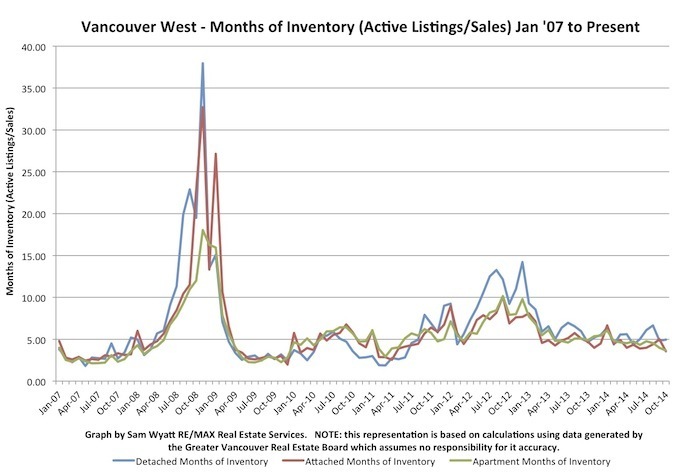 Prices have remained high and have trended upwards over the course of 2014 thus far. Buying Investment property in Vancouver continues, in my opinion, to be a gamble but the purchase of a primary residence is still a good option for many people. With strong sales volumes and pricing, it is a great market for selling real estate. On the investment front, I continue to acquire revenue properties in Fort St. John, BC and to help clients do the same thing. When I see my consistant monthly income roll in from these properties, I am grateful that these funds are not in highly volatile stock markets. Fort St. John and the Peace River District are in the heart of some of the largest natural gas deposits in North America. Premier Christy Clark's election promise to promote BC's natural gas industry likely won her the last election. Properties in the Peace River area are cash flowing beautifully with projected annualized returns of about 20% based on a 5-year hold. If you haven't yet contacted me and are interested in exploring this opportunity, please give me a call.